The engraving, titled The Signing and Sealing of the Treaty of Nanking, was the work of Scottish engraver John Burnet (b.1784-d.1868) after the painting of John Platt (b.1802-d.1857), Captain of Bengal Volunteers, depicting the scene of the execution of the Treaty in the State Cabin of HMS Cornwallis on August 29, 1842. It measures 40.8 cm x 85.8 cm and was published on April 20, 1846 by F.G. Moon of London. The article is currently stored [unknown whether it is actually shown] at the Foreign & Commonwealth Office, Whitehall, London. I was able to find an image of the engraving in a slightly higher resolution which enables a clearer view including facial features of the people. Right beneath it is the key to the engraving in which each of the 56 persons captured in the original painting were numbered. Their names and designations are shown in the scrollable list placed below the key. Move the scroll bars to view both the engraving and its key. The title of the key reads, "Names of the principal officers and official gentlemen who are represented in the engraving of the signing and sealing of the Treaty of Nanking in the Sate Cabin of HMS Cornwallis, 29th August, 1842. The time chosen by the artist was after the Treaty had been signed and sealed, and while the Admiral's Band was playing the National Anthem on the Deck." N.B. This is a scrollable list. Henry Keppel; Capt., RN; CO, HMS Dido. Armine Simcoe Henry Mountain; Lt.-Col.; 26th Regt. ; Dep. Adj.-Gen.
Thomas Bouchier; Capt., RN; CO, HMS Blonde. Alexander George Fraser; 17th Lord Saltoun, Maj.-Gen., 98th Regt. Hugh Gough; Lt.Gen. ; C-in-C, Expedition Force (Land). Henry Pottenger; British Envoy Extraordinary and Minister Plenipotentiary in China. Hwang Antung 黄恩彤, Mayor of Nanking. Elepoo 伊里布; Ch'ing Imperial Commissioner; S-in-C of peace mission; Lt.-Gen., Commander of Chapoo Garrison. Keying 耆英; Ch'ing Imperial Commissioner; head of peace mission; General of Canton Garrison. Robert N. Thom; Assistant Translator and Interpreter. William Parker; RAdm, RN; C-in-C, Expedition Force (Naval). Hienling 咸齢; Lt.-Gen.; under the command of Keying. George Alexander Malcolm; Maj., 3rd (Prince of Wales's) Dragoon Guards; Sec. of Legation. Peter Richards; Capt., RN; CO, HMS Cornwallis. Francis Spencer Hawkins; Brevet Lt.-Col., Com.-Gen.
Wilson, Maj., Paymaster of the Forces. Frederick William Grey; Capt., RN; CO, HMS Endymion. Richard Collinson, Cdr, RN; HMS Plover. Heatley; Capt., 49th, D; Adj.-Gen.
R.B. Watson, Cdr., RN; CO, HMS Modeste. Grahame; army doctor; Surgeon to C-in-C.
J.B. Gough; Lt.-Col.; 3rd Light Dragoon; QMG. Richard Woosnam; army doctor; Surgeon to Henry Pottinger; Assistant Secretary of Legation. John Robert Morrison; Chinese Secretary and Interpreter. Charles Gutzlaff 郭士立; Interpreter; missionary. Niukien 牛鑑; Viceroy of Liang-Kiang. C.E. Tennant; Cdr., RN; Flag Lieut. to RAdm. Parker. Benjamin Chimmo; Naval Sec. to RAdm. Parker and Cdr. Tennant. Grey Skipwith; Lt., RN; HMS Cornwallis. George Tradescant Lay; Interpreter; missionary belonged to the British and Foreign Bible Society. Charles Frederick; Cdr., RN; CO, HMS Apollo. Henry Kellett, Cdr., RN; HMS Starling. William Hutcheon Hall; Capt., RN; CO, HCS, Nemesis. Thomas Maitland, Capt., RN; CO, HMS Wellesley. Knowles; Lt.-Col.; Bengal Royal Artillery. John Platt was an incredibly observant and gifted painter. The sketch was made immediately after the Treaty had been signed and sealed, clearly with great haste, since there were 56 people he needed to draw and since also the Ch'ing mission, I don't think, had the patience for a half-hour-long sitting before retiring from humiliating scene. The triumphant British were elated; Keying and his entourage weren't. Now, even if Platt was given two hours, he would not have been able to sketch 56 facial features. I think what he did was he sketched the Ch'ing delegates whenever he could see them at negotiation and other ceremonial sessions that took place before the day of the signing. As for the key figures of the British mission and the expedition force, he probably had already a stockpile of what he had made since his arrival in China that he could use for this painting. For the rest of all the other officers, since they didn't have much to do now that the fighting was over and they wouldn't be withdrawing in another two weeks, so he went by and made sketches of them, leisurely. The vast difference in attire between the two missions is simply too noticeable to be ignored. British military officers turned up in full dress uniform with swords, while their civilian counterparts also dressed formally in daytime tailcoats. Contrary to the British attendees, all members of the Ch'ing mission, with the exception of Niukien (#41), wore the most casual order of robe designated for Ch'ing officials – changfu 常服 – which was more or less the equivalent of mufti in the Western dress code. Collarless and without the buzi 補子 (Mandarin square) normally found in robes of higher order in the dress code, changfu was worn only in one's own office while not meeting anyone from outside. Their head wear was the matching bianmao 便帽, or casual hat. Why were they dressed like that? Keying gave the explanation that since they (Elepoo and himself) came to Nanking in a great haste and traveling light, they didn't bring their formal wear. But then both of them had been in Nanking for over two weeks and there were plenty of time to send for their dresses. Hwang Antung (#9), Puchingsz of Kongning Fu 江寧布政使 (Mayor of Nanking) did not need to send for his dress, yet he came to the signing in changfu. The next question that comes to my mind is why was Niukien dressed differently than everybody else? He was wearing bufu 補服, or the formal robe with Mandarin square, and court necklace of amber beads 朝珠. Was any part of these a deliberate act? I suppose I'll never find out exactly what transpired. There probably was no established rules that governed how a Ch'ing official should dress when meeting with representatives of a foreign nation at a place where Ch'ing government had no jurisdiction. The below image (of an engraving and etching after the drawing of Harry Francis Colville Darell, Bt. Lt.-Col., ADC to Bremer) shows an example at the opposite extreme. 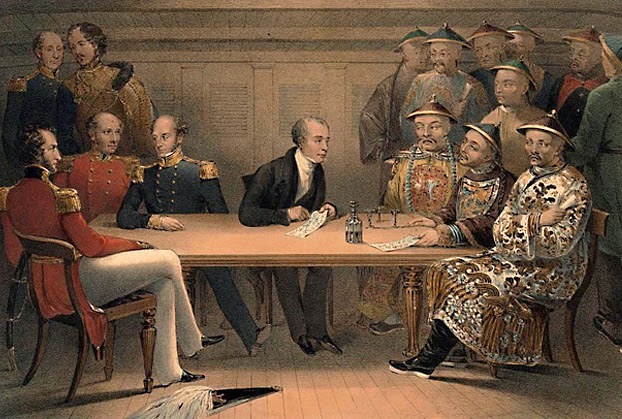 It depicted the July 4, 1840 meeting on board HMS Wellesley off Chusan between John Gordor Bremer, Commodore of the British Expedition, and Chang Chaoufa (Zhang Chaofa) 張朝發, Commandant of Ting-hai 定海總兵. The three seated Ch'ing officials were: Chang; Yaou Kwaetseang (Yao Huaixiang) 姚懷祥, acting Chief Magistrate of Chusan; and Tseen Pinghwan (Qian Binghuan ) 錢炳煥, Chang's Flag Captain. Chang and Tseen were dressed in jifu 吉服 including the brilliantly embroidered python robe 蟒袍, one of the top orders in Ch'ing official dress code inferior only to court dress. 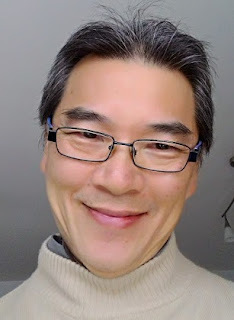 Additionally, Chang wore a piling 披領 (ceremonial collar). Yaou wore bufu. The day after the meeting, whereat Chang was asked by Bremer to surrender and he refused, the British expeditionary force launched a general attack on Chang's fleet and the wall city of Ting-hai. Chang was wounded and died soon after. Tseen was also wounded but survived. Yaou killed himself when the wall city fell on the second (and the last) day of the battle. Colonel John Platt killed by the mutineers at Mhow, 1st July 1857, from 'The History of the Indian Mutiny', engraving, published in 1858.John Platt was born at Kings Langley, Hertfordshire, England in April 1802. He joined the 25th Bengal Native Infantry in July 1820 as an ensign. The infantry was part of the Bengal Army that belonged to the East India Company. He transferred to the 23rd Native Infantry in 1824 and afterward to the 2nd Volunteer Battalion, the latter was sent to China as a part of the British expeditionary force. With it, Platt arrived in China in June 1841 and stayed through the conflict till its end in August 1842. Between 1843 and 1847, he served as commandant of the 2nd Regiment of Oudh Light Infantry and was advanced to Major. He then returned to his old regiment, the 23rd Native Infantry, and in June 1853 was appointed Lieutenant-Colonel as well as commander of the regiment. 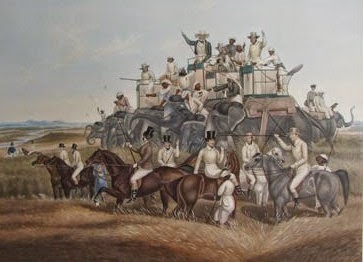 Platt was killed by mutineers of his own regiment at Mhow on July 1, 1857. His body was found in the following morning lying on the parade ground inside the cantonments with multiple gunshot wounds and gashes of a tulwar. Platt was the second of four children of Rev. Alexander Platt (curate of All Saints Church, Kings Langley 1796-1806) and Charlotte [maiden name unknown]. John Platt was married to Charlotte Atkinson. Hog Hunting. The Tired Pig., 1850, aquatint, published by Fores of London, ca.1850. Hog Hunting, The Find, engraving, published by Fores of London, ca.1840.